1. UTEX (Unit Exchange) – with customer obliged to send his old unit (core) before or after MDC ships the remanufactured unit. 2. Rebuilt Outright – no core required. The table shown below illustrates the series of parts MDC covers under our REMAN program. Other, selected parts, such as camshafts and rebuilding of exhaust systems may also be performed in our shop. Remanufactured turbo ready for shipment to an overseas customer. Alco 6 cyl. 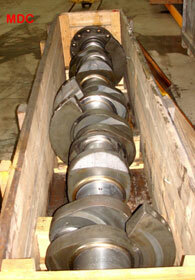 crankshaft received from customer and ready for our REMAN program.